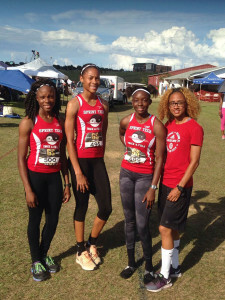 Sprint Tech Track Club athletes demolished two Jr. relay records during Saturday’s 41st Flo Golden South Classic in Claremont, Florida, as several athletes also recorded personal bests marks. Led by their Jr. 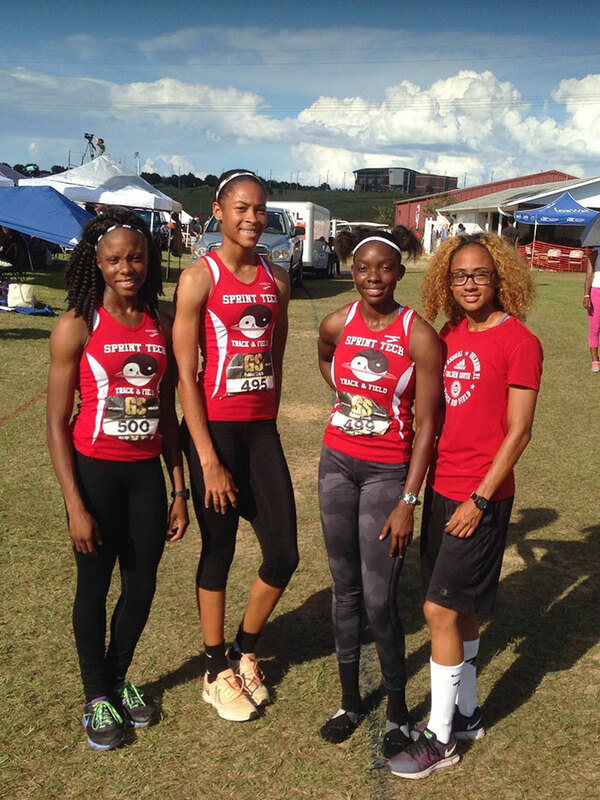 Girls quartet, the foursome of Judine Lacey, Beyonce DeFreitas, Tarika “Tinker Bell” Moses and Lakeisha “Mimi” Warner, shattered the year-old Classic Division Girls 4 x 400m Relay meet record of 3 minutes 45.92 seconds, with a break away time of 3:41.36. The mark also smashed the eight year-old BVI National Jr. Girls Record of 3:42.73, established by Samantha John, Ashley Kelly, Britney Wattley and Chantel Malone in 2008. It’s the second best time on the territory’s All Time List. That mark came after the quartet of Zacharia Frett, DeFreitas, L’T’Sha Fahie and Warner, finished third in the Classic Girls 4 x 100m Relay in 45.78 seconds, to break the two-year old National Jr. Record of 46.30 seconds, becoming the territory’s ninth squad overall and the first Jr. team to run under 46.00. The Sprint Tech boys—Rackeel Jack, K’Cei Moses, Valique Graham and Josh Hill—were second in their heat of the Classic Boys 4 x 400m Relay in 3:26.39—the sixth best time of the meet. In individual events, Warner was the class of the 400m Hurdles field running 59.59 in the prelims and 59.79 to win the Classic Girls final as the only runner under 60 seconds. After a third place finish in the Classic Girls Long Jump with a 5.76m leap, Fast Lane’s Kala Penn topped the pile in the Triple Jump with a mark of 12.11m on her second attempt, as she put together her most consistent series and had a back up 12.04m mark on her final effort. Sprint Tech’s Arianna Hayde finished 18th with a 4.96m Long Jump effort. She didn’t have a clearance in the High Jump. L’T’Sha Fahie ran 11.86 seconds to advance to the Classic Girls 100m final where she finished fifth in 12.07. DeFreitas had a non advancing 12.17 in her heat. In the Boys equivalent, Rikkoi Bratwaithe ran 10.88 seconds to make the final and was sixth in 10.97. Moses was third in the Girls 200m final with time of 24.27 seconds after running 24.37 for second in the prelims. Frett had a non advancing time of 24.96. K’Cei Moses finished in 22.37 seconds but did not advance to the Boys final. Lacey ran 56.99 seconds in second to grab and automatic spot in the Classic Girls 400m final where she was fourth in 56.63. Virgin Gorda’s Raw Skillz Track Club’s Shaniyah Caul was also a finalist after running 58.10 and placed eight in the final with 1:00.05. Fast Lane’s Ronique Todman used a 400m personal best of 48.30 seconds to qualify for the Classic Boys final, where he was fifth in 48.69. In the Prep Division, Sprint Tech’s Naya Penn won her 100m heat in 13.33 seconds. Fast Lane’s Johnt’a Charles used an 11.25 seconds lifetime best to win the Prep Boys 100m. Sprint Tech’s Sh’Kaida Lavacia had a career best of effort of 59.37 seconds in the 400m to place third in her heat ahead of teammate Akrisa Eristee’s best effort of 59.49, as they finished fourth and fifth overall respectively. Hill broke 50.00 seconds for the first time in his history by running 49.55 for second in his heat, the division’s fifth fastest time. Graham recorded a 52.49 time for seventh in his section while Jevon Smith ran 54.10 and Vadley Sylvester finished in 59.87. Sprint Tech’s Alisha Hayde used her fastest ever run of 2 minutes, 30.76 seconds to finish sixth in the 800m, while Raw Skill’s Mariah Christian was 11th after recording a career best of 2:32.02. Raw Skill’s Deron Leslie was second in his 800m section with a personal best run of 2:09.76. Charles ran 22.48 seconds to win his 200m heat. Penn’s 27.15 seconds was good for second in her section of the 200m while teammate Shenique Erickson, was timed in 29.37 seconds in the 200m, placing fifth in her heat.